Sometimes the most beautiful gift is also the simplest and most thoughtful. This lovely and classic bouquet expresses love and friendship in equal measure. 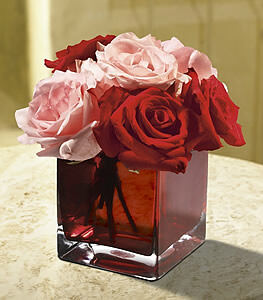 Pink and red roses are delivered in a red cube vase. Note: not available in all areas; a clear cube may be substituted if the red cube is unavailable.